Once or twice a month I come out with a new “Theory Tip Tuesday” as a way to motivate and inspire piano students and piano teachers. It’s a way for me to teach music theory the FUN way – emphasis on the word FUN. I don’t think music theory should ever be taught alone on one side of the musical dimension because it cannot exist on its own. The entire purpose of teaching music theory is to teach what students can do with that music theory to begin creating music of their own, either by arranging or composing music. Music theory is then taught by how students can apply the scales, modes, and chords into their playing. It is not just about being able to identify what key signature a piece is in or what time signature you are using. Being able to identify a major or minor triad in any position or inversion is wonderful, but if you don’t know what to do with that knowledge, then it is meaningless because you need the practical application of music theory. Learning how to do something is important, but knowing why you are doing it is even more important. With this series, I hope to first teach the basics of music theory with what I refer to as the FUNdamentals of music theory, and then go on to teach more in depth concepts in music theory, improvisation, and composition. Those are the three main areas I like to focus on because I feel they are often the three most neglected areas of musicianship. I refer to them as Theory Therapy, Innovative Improvisation, and Creative Composition. Those are my own terms and I like the imagery of how they try to connect piano students and piano teachers with those concepts. I tell students I want them to be able to read anything that is placed in front of them and play all different kinds of music. However, once they can masterfully play the piece as it is written, I would like them to begin playing that piece in many different styles and key signatures. Learning and even perfecting any musical repertoire is only the beginning; it is not the final destination. There are hundreds of styles and variations available to try, and students can take the music theory they have learned and arrange the piano piece into any style or genre. They can also compose music of their own. I firmly believe this helps piano students connect with music on a much deeper level and enjoy making music because they take ownership of the music. Since it is not someone else’s music, they put more effort and energy into learning to play the piano because they have fun and learn to love it because they want to and not because their parents want them to and especially not because their piano teacher wants them to. Little children often ask “why” every day. I try to pose that question to my own piano students. “Why do I want you to learn this scale or chord? Why should you? Why do we learn music theory? Why are so many piano students not having fun and quitting the piano? Why are other activities perceived as more important or take precedence over the piano?” There are a lot of “why” questions. The key is what are we going to do to help piano students learn and improve at the piano and be able to play with great skill and have fun doing it? I think we can teach them to use the music theory in a fun way that allows them to be in the musical driver seat. A great way to teach the theory of seventh chords and what to do with them is to teach jazz improv. If they know the seventh chords they can begin creating at the piano even if their note reading skills are not where they should be. Many times I have had piano teachers ask me how to motivate or inspire a student who seems to be done with classical music and wants to quit the piano. I have told the teachers not to quit teaching classical music altogether but to try other elements. A ii-V-I jazz chord progression is a fun way to engage the students and encourage them to learn music theory the fun way and learn what they can do with it. It’s a win-win situation for the piano teacher, the piano student, and the parent of the piano student. For the Theory Tip Tuesday exercise and video for today, November 10th, 2015, I decided to teach “How to Play the ii-V-I Jazz Chord Progression in All Keys.” In this video I start by teaching students how to create seventh chords and explain about the ii-V-I chord progression. The beginning of the video starts a little slower to make sure the students grasp the concept and then we start moving quickly as I teach how to take the simple ii-V-I chord progression and improvise over it. Jazz is all about learning to use music theory to improvise with the chords, scales, and modes. In this video, students learn how to play the blocked seventh chord with the left hand while the right hand improvises with the notes from the same seventh chord, breaking them apart and mixing up the order. I also teach students how to incorporate a chromatic scale (the half step scale) into this example as well. Students also learn to create a whole-half-half walking bass left hand pattern and how to improvise with the ii-V-I seventh chord progression in the right hand. 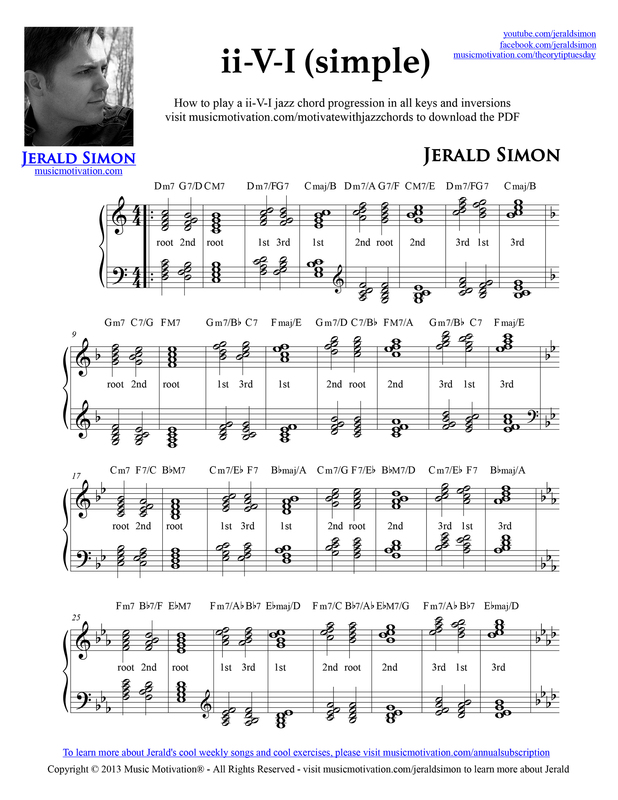 You can click on the image above to download the FREE PDF exercise of the ii-V-I (simple) chord progression in all keys and in all inversions. This is a FREE PDF download and anyone can download this and print it off for their own use. Watch the video above as I teach you how to play what is written in this PDF and then how to take the theory and apply it to create fun improv patterns of your own. Students not only love doing this, but also enjoy performing this ii-V-I jazz chord progression for their family and friends. Whenever I teach this to students and piano teachers, I hear feedback that the students have been playing this chord progression non-stop and are having fun showing and teaching their friends how to do it as well. That is so motivational when the student begins showing their friends how to do what they have learned. The students can’t wait to share their excitement with others and the momentum builds. It’s fun to see where that excitement takes them on their musical journey. Have fun with this and share it with other piano teachers, piano students, or parents of piano students who may enjoy learning and playing the ii-V-I jazz chord progression on the piano.